Two Postdoctoral and a Project Manager position are now open with deadline for applications 08/01/2017, to work based in the Division of Biomedical Engineering at the University of Glasgow. These jobs are part of our five year cross-disciplinary EPSRC Programme Grant with partners in the Universities of Glasgow, Nottingham and Imperial College. “Bioengineering for Cancer: Microenvironment, Modelling and New Approaches” it’s a 1-day Centre Workshop happening at the CRUK Beatson Institute, Garscube Estate, next Monday 28th of November. Co‐organisers are Manuel Salmeron­‐Sanchez and Laura M. Machesky. Registration is free and there’s still time to register abstracts. Deadline is 1st of November. The aim of this event is to provide interactions and ideas for collaboration among local bioengineers and cancer biologists. More info and registration links here. 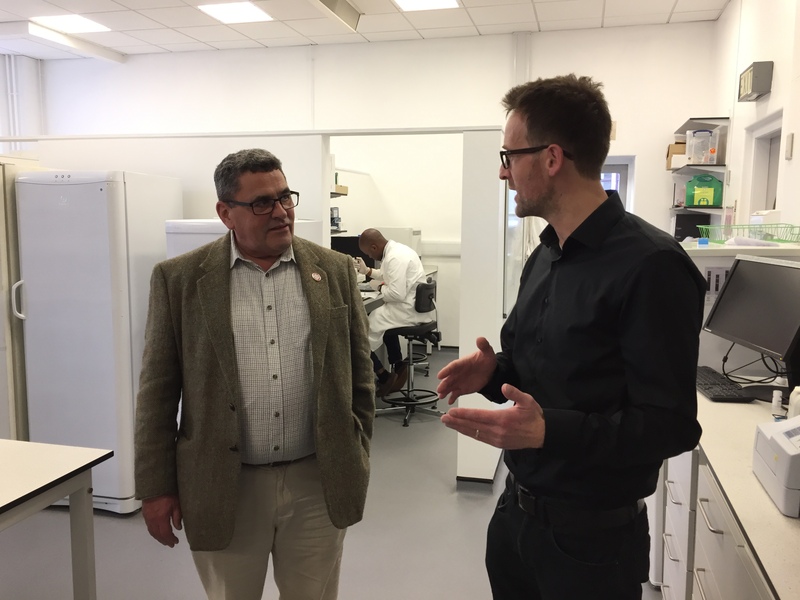 The Find A Better Way (FABW) charity announced last month £2.8m of funding for a regenerative medicine project based in Glasgow. 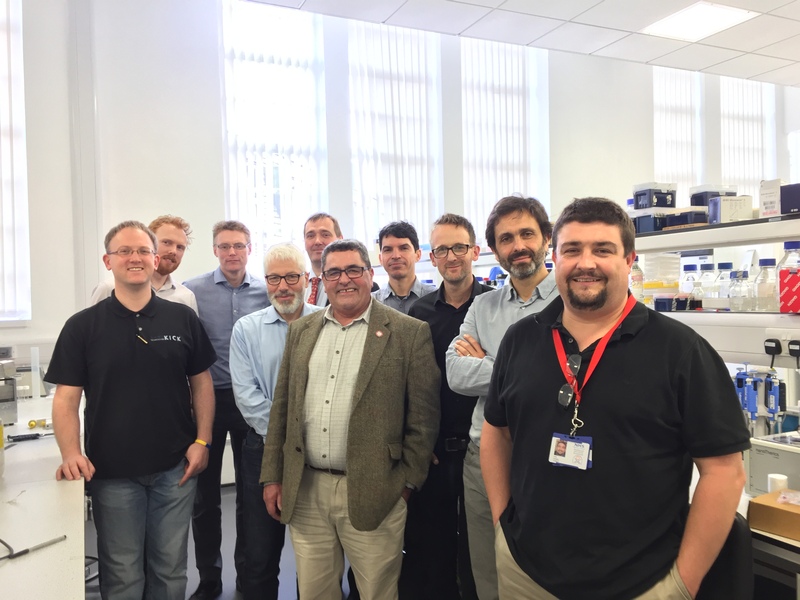 Last Thursday we hosted CEO Lou McGrath OBE to meet researchers from all the partner teams and tour the facilities of the Centre for Cell Engineering at the University of Glasgow. Lou started the meeting by explaining FABW’s history; it was established to reduce fatalities and injuries caused by landmines and other explosive remnants of war. The charity was founded by Sir Bobby Charlton after he visited Cambodia and Bosnia as a sport ambassador where he witnessed the devastating effects of landmines. Lou brought to the meeting a few deactivated landmines retrieved from war zones. We were all surprised and struck by their small size, simple design and low cost of production, in stark contrast with the stories Lou recounted of the devastating harm they can cause. 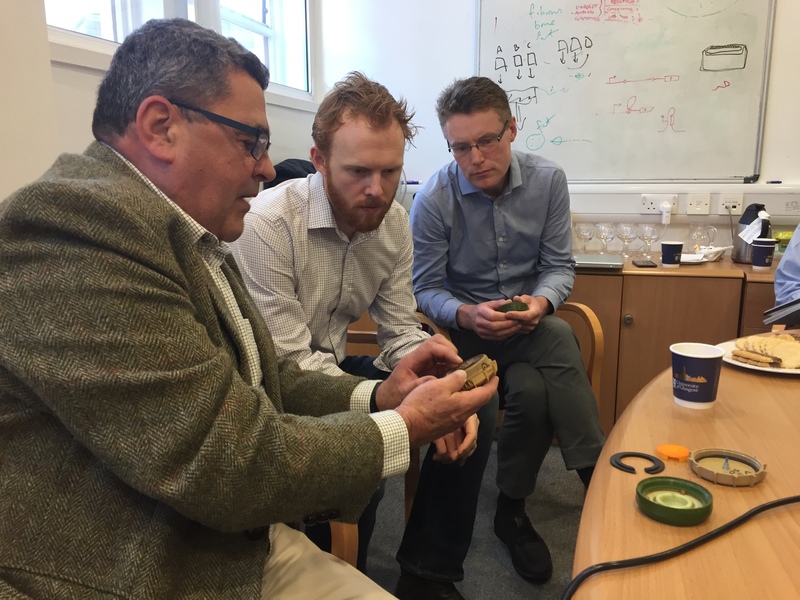 We learnt a lot about landmines, landmine injury and landmine detection that will help us as we progress the research. 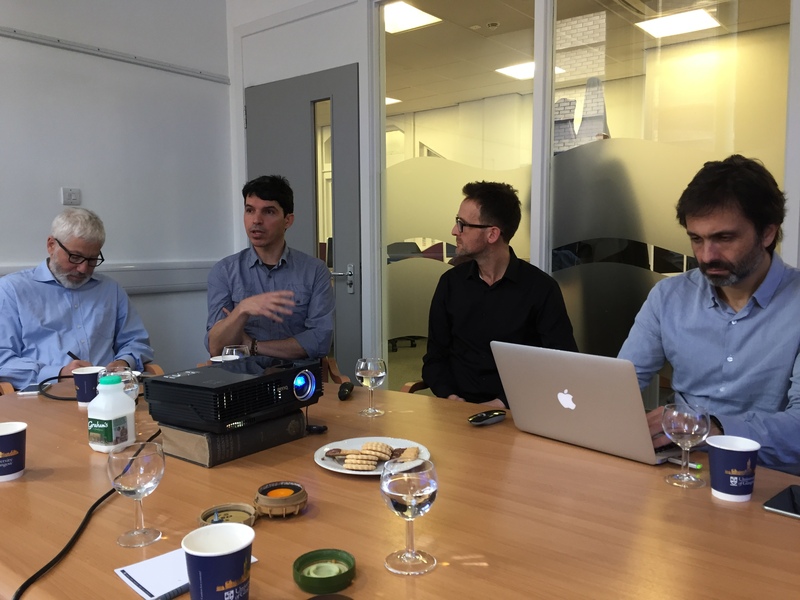 With a few slides and informal conversation, we explained the project and the general scope of our work to Lou. Our project plans to develop novel technologies that will allow the production of custom designed bone grafts with controlled anatomical shapes. The project will result in the development of a treatment for blast injuries with significant loss of bone. Bone will be produced in the lab by combining two technologies in which the research team are world leaders. First we will use growth factors, which are molecules that occur naturally in the body and play a critical role in the regenerative and healing processes. They are already used in clinical applications with success. In our technology the growth factors are tethered to 3D printed scaffolds that firstly support the cells’ growth into the correct tissue: we coat the scaffold in poly(ethyl acrylate) (PEA) and then fibronectin, a protein naturally found in the body. The PEA causes a conformational change in the fibronectin allowing an open conformation to which growth factors can bind to. With our technology the scaffolds can be coated with very low doses of growth factors that actively promote bone formation, which are also safe for the patient. This would be used in combination with new technology “Nanokicking”, developed here in Glasgow. Nanokicking refers to nanoscale vibrations that induce mesenchymal stem cells to form bone cells. With Nanokicking, the time that is required to produce bone in the lab will be reduced, enabling us to efficiently produce and ship the bone wherever it is needed in the world. The funds will go towards research including an initial human study of the technology in the body. This study will use bone cells produced using these techniques, to help the reconstruction of complex fractures in fingers. This is thought to be a good starting model for more demanding scenarios and will allow progression to a full clinical trial afterwards. Lou McGrath and Matt Dalby in the CCE labs. Discussing the project. From left to right: Mathis Riehle, Andrés Alba-Pérez, Matt Dalby, Manuel Salmeron-Sanchez. 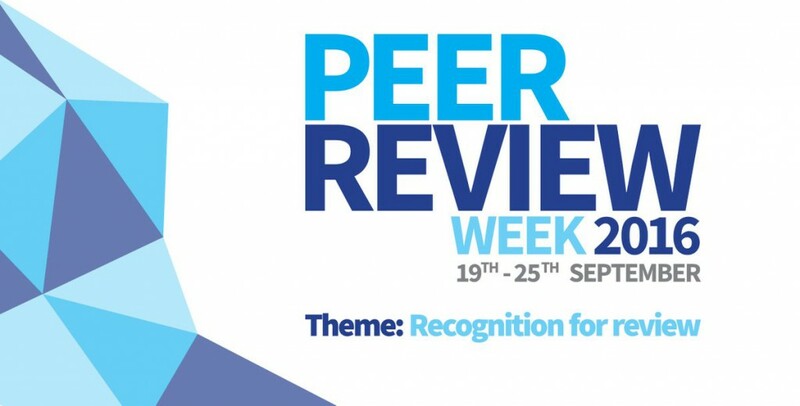 As part of the Peer Review Week 2016 global event, Prof Salmeron-Sanchez has been named as one of the top 10 reviewers for Integrative Biology in 2016. Integrative Biology is a journal edited by the Royal Society of Chemistry that publishes research based on experimental or computational quantitative technologies to characterise biological systems at the molecular, cellular, tissue and population levels. mMSCs under basal conditions. Immunofluorescence for osteogenic, adipogenic, and stemness markers expressed under basal conditions and quantification of staining intensity. Full details in paper. A new paper was published last month online on the journal Advanced Functional Materials by Patricia Rico, Hayk Mnatsakanyan, Matthew J Dalby and Manuel Salmerón-Sánchez. The paper, “Material-driven Fibronectin Assembly Promotes Maintenance of Mesenchymal Stem Cell Phenotypes“, describes a material system capable of sustaining the growth of stem cells (maintaining stemness) and of promoting highly efficient differentiation with adequate stimulation. The control of stem cell fate is a critical tool in the development of regenerative medicine strategies and in the study of fundamental biology mechanisms. Poly(ethyl acrylate) induces assembly of fibronectin (FN) into nanonetworks (FN fibrillogenesis) upon simple adsorption from solutions. In this paper it is shown that these FN nanonetworks allow growth of MSCs and maintenance of stemness for long periods of time (up to 30 days) using basal media in absence of soluble factors. The system promotes enhanced levels of differentiation when defined supplemented media are used. Bioengineering for Cancer – Workshop at the CRUK Beatson Institute next 28th Nov. Deadline for abstracts 1st Nov.
“Bioengineering for Cancer: Microenvironment, Modelling and New Approaches” it’s a 1-day Centre Workshop happening at the CRUK Beatson Institute, Garscube Estate the next Monday 28th of November, 2016. Co‐organisers are Manuel Salmeron­‐Sanchez and Laura M. Machesky. Registration is free and deadline to register abstracts is 1-11-2016. Fatma M Bathawab, a third year PhD student at our lab, has been awarded the prize for Best Poster Communication at the BORS 2016 Conference held earlier this week in Glasgow. Congrats Fatma! The poster details the use of a set of four polymers – Poly(methyl-, ethyl-, butyl- and hexyl- acrylate), i.e. PMA, PEA, PBA and PHA – characterised by similar surface properties e.g. stiffness, to study the effect on the protein layer at the material interface of their increasing molecular surface mobility. Three of these polymers spontaneously induce the assembly of physiological-like fibronectin nanonetworks. The influence of polymer mobility on stem cell fate was also investigated. The work showed that a greater exposure of fibronectin sites important for cell adhesion and differentiation in the FN network conformation occurs in these polymers compared to the globular conformation on PMA, thus producing a non-monotonic effect on differentiation of mouse pre-myoblasts. Using ELISAs more BMP-2 growth factor was shown to be bound on PEA compared to the rest of the polymers. This correlates to our observation of increased osteogenic differentiation of human bone marrow mesenchymal stem cells (hMSCs – BM) grown on PEA compared to the rest of the polymers. The poster authors hypothesize that PEA is more efficient at exposing FN sites important for BMP-2 presentation. More info about the BORS 2016 Conference here. The British Orthopaedic Research Society (BORS) 2016 meeting will be held in the University of Glasgow this 5th and 6th of September. For Monday evening we have scheduled a Conference dinner and Ceilidh! We show in this paper that many of the topography-driven changes in adhesion and cytoskeleton organization responsible for processes such as the control of cell differentiation are mediated by the protein interface. We manufactured nanostructured polycarbonate surface comprising 150 nm-diameter pits originally defined using electron beam lithography and analyzed the effect on FN adsorption and subsequently on cell morphology and behavior using C2C12 myoblasts. Wettability measurements and atomic force microscopy imaging showed that protein is adsorbed both within the inter-pits spaces and inside the nanopits and facilitates cell exploration of the pits. Cells responded to this coated nanotopography with the formation of fewer but larger focal adhesions and by mimicking the pit patterns within their cytoskeleton, nanoimprinting, ultimately achieving higher levels of myogenic differentiation. Both focal adhesion assembly and nanoimprinting were found to be dependent on cell contractility. 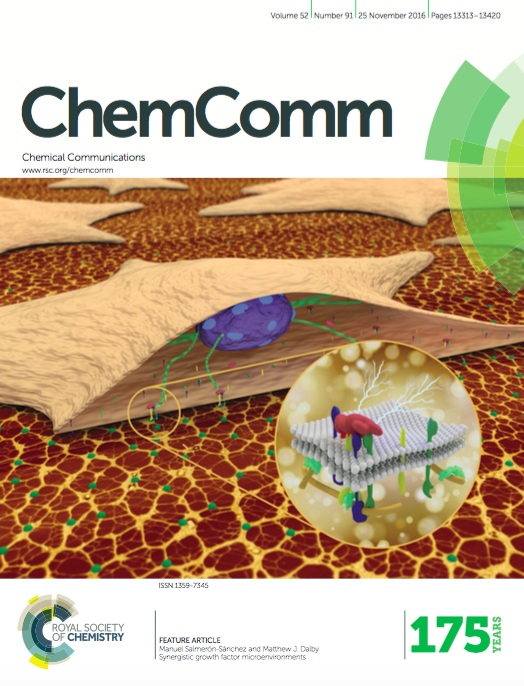 Our results demonstrate the central role of the nanoscale protein interface in mediating cell-nanotopographical interactions and show this interface works helping control the mechanotransductive cascade.